Bungie's new game series won't be radically different from "Halo"
(CNN) -- Working from a new home base in a converted movie theater, the developers of Bungie are toiling away on their next video game, one that will have nothing to do with the franchise that put them on the map. About 200 programmers, designers and managers collaborate in the Bellevue Galleria mall across Lake Washington from Seattle. The rooms are decorated with futuristic combat helmets and familiar alien creatures, all memories of the blockbuster "Halo" game series they unleashed on the world nearly a decade ago. Hanging on one wall is a framed comic strip, perhaps there as a reminder about why Bungie recently took some significant risks in ending a comfortable relationship with its former parent company, Microsoft. The strip depicts a level of "development hell" and shows three Bungie employees, surrounded by flames and taking orders from a hideous alien, who barks, "The Demo will be completed by E3!" The panel's header reads: "Level 14: Forced to create Halo game after Halo game." Bungie split from Microsoft in 2007, shortly after the release of "Halo 3" for the Xbox 360. Even so, the company still developed two more games for Microsoft, all "Halo" affairs. Microsoft, which acquired Bungie in 2000 to help launch its first home game console, has invested a minority stake in the new independent Bungie. The longtime partners had "forged a deep and long-term development and publishing relationship," Bungie said in a 2007 statement. Harold Ryan, Bungie's studio head, also said in a statement then that developing for Microsoft platforms was his "primary focus." 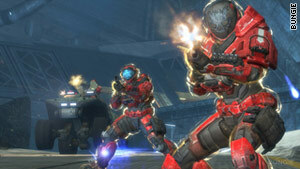 2010's "Halo: Reach" was just one of many hits in the blockbuster game franchise. But those agreements are mostly coming to an end. And within the next few years, Microsoft will find itself competing directly with a new game from its former golden goose. "Bungie was a fantastic developer," said Kevin Unangst, a senior director for Microsoft Game Studios. "They built a number of great 'Halo' games for us." With the goose gone, Microsoft is now trying to clone its golden eggs. The company has given Frank O'Connor, a former community evangelist for Bungie, the keys to the machine. Microsoft installed O'Connor as the public face of 343 Industries, a subsidiary that takes its name from an untrustworthy character in "Halo." As the franchise development director, his job is to shepherd new "Halo" games and an endless supply of ancillary products, such as a best-selling novel, "Halo: Cryptum," and an upcoming Marvel comic-book series. When it comes to new games, though, Microsoft is keeping "Halo" details close to its chest. The 343 division in Redmond, Washington, can't seem to hire fast enough, posting several job openings for game developers each week. It has also hired a few people from Bungie, as well as high-profile executives such as a producer for some of the "Metal Gear Solid" games. O'Connor, a former gaming journalist who started his first studio job at Bungie when the team was wrapping up "Halo 2," is steering the $2 billion franchise and its fans' insatiable appetites. "It's a big, giant machine, and it's much more complicated than it used to be," he said. "I'd just like people to rest assured that we are taking incredibly careful, diligent, imaginative steps to make sure that the 'Halo' universe remains true to itself and continues to grow organically and profoundly in exciting new ways." To satisfy fans who have come to expect a new "Halo" game every year, O'Connor will soon need to put a disc in gamers' hands. He said announcements are planned for later this year but declined in a recent interview to provide details. Some reports say Microsoft is planning to revive the series debut, called "Halo: Combat Evolved," for an Xbox 360 release around the winter holidays, adding top-of-the-line high-definition visuals and support for 3-D televisions. Saber Interactive, the studio reportedly working on the game, didn't respond to a request for comment. Last month, Microsoft reached a milestone when it offered the first new "Halo" game content that wasn't made by Bungie: a downloadable Defiant Map Pack, which includes new levels and was developed by a Dallas group called Certain Affinity. The reception was positive. Bungie's waning involvement in "Halo" and with Microsoft is little known outside the industry. Microsoft would like to keep it that way. "343 Industries is doing a phenomenal job and continues to shepherd that franchise in a fantastic way that the gamers are going to be excited about," said Unangst, the Microsoft director. "The same people are running the franchise. That hasn't changed at all." Microsoft is hoping the transitions are made seamlessly and without drawing attention, say Microsoft and Bungie representatives. For one, Bungie will hand over the reins on managing many aspects of "Halo: Reach," the newest game, but will continue to host statistic tracking for players, said Bungie spokesman Eric Osborne. While 343 has existed for about two years, it's difficult to downplay Bungie's importance to the series it created and grew over a decade. As a Bungie employee, O'Connor said he contributed ideas to the "Halo" storylines, as most within the company are encouraged to do. But that invitation was revoked once he took the job at Microsoft, and 343 did not contribute to development of the "Halo" games, Bungie's Martin O'Donnell said. O'Donnell is the composer who scored the game's powerful soundtracks and an early Bungie employee. At one time, O'Donnell was O'Connor's boss, a Bungie spokeswoman said. Bungie operated almost entirely independent of Microsoft in terms of product development. Microsoft quickly learned that its ideas about how to run the game franchise weren't welcome. "When we were purchased by Microsoft, we told them: You need to keep us isolated," O'Donnell said. "If we just stayed good employees, they would have been thrilled." But Bungie began to grow restless a few years into its life at Microsoft. Eventually, the situation became untenable, and the agreement to split was mutual, O'Donnell said. "There wasn't bad blood between us," he added. Bungie has mostly been laying low since then. But the company drew attention to itself a year ago when it signed a 10-year partnership agreement with Activision Blizzard, Microsoft Game Studios's chief competitor. Activision announced then that unlike Microsoft's Xbox-exclusive "Halo," the new games would be available for multiple systems. "Bungie is always looking for the best partner to bring our universes and stories to a worldwide audience," Bungie's Ryan said then in prepared remarks. "Activision is the best partner for this." As with Microsoft, Bungie has made it clear that it's not looking for input on how to make its games, and Activision has remained hands off, O'Donnell said. Activision also makes the popular "Call of Duty" series. Bungie has spurned multiple requests to provide details on its new game. The company recently posted a page to its website seeking people to test beta versions of its software. But an announcement about the project is not expected any time soon. O'Donnell did say the new game wouldn't be radically different from "Halo," which could mean another action game is in the works. "We're always about evolving things," he said. "It wouldn't make sense for us to think about a (radical) departure." More important to Bungie, the company will own the rights to its new franchise, which it began working on in 2007, and will get to make the call about when to shoot it in the head. "We are definitely ready to not be in the 'Halo' universe," O'Donnell said. Events in the next few months may make it tough to avoid it. On July 7, Bungie will hold its annual celebration, where it will give prizes to "Halo" fans. Osborne, the spokesman, declined to outline specific plans. Then, starting on August 26, Microsoft will host a three-day event called Halo Fest as part of the Penny Arcade Expo (PAX), a gamer festival in Seattle. "This year for us is in some ways, weirdly, going to be one of the biggest 'Halo' years," 343's O'Connor said. The official 10-year anniversary is on November 15, pegged to the launch of "Halo: Combat Evolved," he said. Bungie had used previous PAX conventions to unveil first looks at "Halo 2" and "3." Mike Fehlauer, Penny Arcade's sales executive, believes Microsoft might use the PAX event as a launchpad for a new "Halo" game but says he is not privy to what Microsoft is planning. "It could be pretty odd to have a celebration of 10 years of 'Halo' without a Bungie presence," Osborne said. "We know that they want us to have a presence there." He indicated that Bungie would likely be there but declined to say much more. "You can't really separate Bungie from 'Halo,'" Fehlauer said.